Happy 2012, Friends and Supporters! This year started with a visit from a friend and supporter, Liz Fratus, of New England's Lost Paws Rescue in Massachusetts. It was wonderful to have an "internet" friend come and see the work we do. Thank you, Liz, for visiting and sharing your wealth of knowledge with us. 2012 also brings a new Board of Directors and additional Advisory Board members. These new members will be directing Full Moon Farm's growth into the next decade, and I hope you will join me in welcoming them! Also, we are pleased to announce that Full Moon Farm is having its 10th Anniversary this year! Stay tuned for our Special Events to be posted on the website, and we hope you will visit and help us celebrate 10 years of providing rescue, rehab, and sanctuary for wolfdogs. Just a reminder, although the season has been mild, winter is a hard time of year for us in terms of fundraising. We could really use your extra support now. Will you please donate money, time, services or goods? Our immediate needs are listed below, and remember, all donations are tax deductible, so please help us however you can. Thank you in advance, and a Joyous New Year to all! A new or gently used 4WD truck. Our 1999 has more than 250,000 miles on it, and is developing "issues" that are becoming cost prohibitive to repair. A new or gently used Van. Must have rear air, so a cargo van will not work. A mini van or full sized van will replace our 2001 Chevy Express 3500, with more than 240,000 miles. A gently used travel trailer or Park Model that can be used to house interns. Donations of the above, cash donations or grant writing help to buy them. Tractor Supply Gift Cards - will help us buy dog food AND fencing material. Home Depot or Lowe's Gift Cards - will help us get fencing materials and building supplies. Monetary donations for our general operating expenses. Volunteers to help clear land for new enclosure. Volunteers for fence building projects. Gravel for the driveway and farm road improvements. Tree service work to clean up 2009 storm damage. A new roof for the office/cabin. Corporate Sponsorships to help in underwriting capital improvement projects and public events. I would like to thank all of our supporters for believing in Full Moon Farm. It's your generous donations that allows us to continue to do what we do. It is my wish this year that every wolfdog at FMF have a sponsor. I also hope to see everyone at the up and coming Howl Ins, starting in April. If you sponsor one of our residents we welcome you to come and visit them, tour the farm, hear the beautiful howls, and see first hand why each and every one of us here at FMF are so compassionate about what we do. Happy howls to you all! Pease check out our Howl In dates and 2012 Events. As we put 2011 behind us and forge ahead into our 10th year in existence we want to make sure that our supporters know what our goals are for the year and what we hope to accomplish. We have an excellent group of volunteers and board members and they all bring their unique talents and perspectives to the organization. To read about our volunteers click here. Below are just few of the things we want to accomplish this year and we hope you will help us any way you can! We will continue to host our monthly Howl Ins during the warm months. 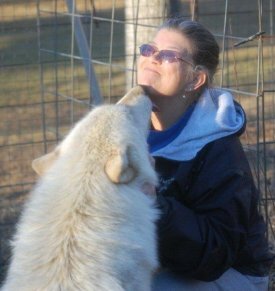 The Howl ins are a great way to meet new people and a way for us to educate the public about wolfdogs. If you have never been to one it is a must. You will be hooked I promise! We have an amazing following throughout the United States, but we need to create more awareness in our own back yard. We will be working hard to spread the word across Western North Carolina about our wonderful organization. Please help us generate more awareness by talking to your friends, sharing our Facebook posts, and attending our events. We are also making improvements to our website thanks to our dedicated volunteer, Vincent Barco. We will be researching various grants throughout the year as well as launching new fundraising projects such as our online store, calendar sales, gift certificates, corporate sponsorships, and we’ll continue with our tried and true projects such as our animal sponsorship program, special events, gift shop, and more. This past Christmas one of our board members, Lily Cascio, wrote a wonderful poem about Full Moon Farm in the tradition of the Night Before Christmas. We all loved it so much that we decided to turn it into a video for the 2012 holiday season. Stay tuned next holiday season for Twas the Night Before Christmas on Full Moon Farm staring your favorite wolfdogs and FMF volunteers! Nathaniel Tingle is Full Moon Farm’s full time volunteer on site animal caretaker. Since we are an all volunteer organization, his position is a true labor of love, dedication and commitment to the rescues. It is a 24/ 7 position for no pay, other than slobbery canine kisses and personal satisfaction. He works in all kinds of weather at all hours of the day and night by the light of the moon at times! 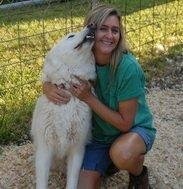 We know what a gift our caretaker is giving the wolfdogs at the Sanctuary and are sharing it with you, our supporters. Nathaniel came aboard as caretaker at the farm in late July 2011. He volunteered with our previous caretaker and trained under Nancy. When asked why he does this work Nathaniel says, “It is the knowing that what you do matters, that it helps take care of the animals." This speaks of the true character of this fine young man. He also feels his payment comes from the love and the bond with the animals in his care. Nathaniel is from Haywood County, NC and is one of our youngest volunteers. His sense of dedication , responsibility, and heartfelt desire to care for the residents comes with complete sincerity, and is way beyond his calendar years. 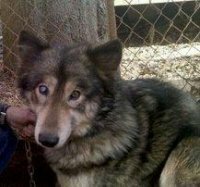 Nathaniel worked for a year and a half with a German Shepherd kennel near his home and was responsible for their daily care and assisted in training too. He has a knack for understanding canines and has a "way" with the animals. We are proud to have him here. Nathaniel is modest, honest, honorable, and generous man and asks nothing for himself. 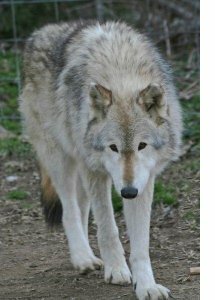 You will often find him at a Howl In working hard or sitting with a wolfdog in their pen to keep the wolfdogs company who get a little nervous with visitors. It takes a special kind of person to give so much to so many for the simple joy and love of what he has chosen to do! Full Moon Farm is very lucky to have Nathaniel and may he stay with us for many years to come! Please remember to thank Nathaniel when you visit. (Gifts of quick meals, gift certificates or grocery gift cards would be appreciated with our thanks. We are thankful for any and all assistance. Our Woofer Spotlight this month is a new resident, rescued last week from a Craigslist ad. Meet Isabella! While we are continually FULL, and turning animals down daily, sometimes we just have to step up to the plate and make room. This was a case where saying no was not an option. 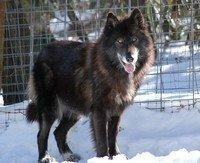 Isabella was placed on Craigslist as a 95% wolf. Cory Sistare, a volunteer, saw the ad and went to evaluate her. When he saw the conditions she was living in and was told the owner would give her to anyone, he loaded her up and headed to the farm. Isabella, is a low content, Husky, Malamute and German Shepherd mixed female, approximately five years old, that has had multiple litters. She represents the "typical" wolfdog, misrepresented percentage, sold purely for profit, to a person without proper containment. Isabella kept escaping and Animal Control was involved, hence our intervention. 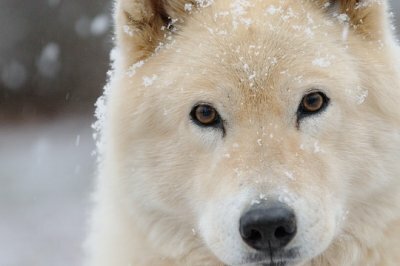 She was bred to "recoup" the purchase cost, and her pups sold as misrepresented "wolfdogs." As you can see by her picture, she is a pretty girl with a damaged, blind eye. She is underweight, and her coat condition is poor - BUT - her life has changed, and she has been treated for parasites, receiving extra, high quality food, and lots of love from our volunteer staff. Cory, Meg and Nathaniel know that Isabella is shy, but also very sweet. We have high hopes that her socialization skills will blossom, as on the ride to the farm, she was a great co-pilot as she put her paw on Cory's lap and his heart melted! Isabella is in need of veterinarian care, for a damaged eye, acute parasite infestation, shots and a spay, as well as a new enclosure. Donations and sponsorships can be made online or checks mailed to Full Moon Farm, Inc, P.O. Box 1374, Black Mountain, NC, 28711-1374 - note: Isabella. If you have ever watched a wolfdog you know what power and grace they possess. In this photo of Belle see how the placement of the feet are directly behind each other. It is called single tracking and it is how they "roll", "float" or "glide". It is this movement that leaves just two foot prints. Single tracking is common in wild canines, and quite a few working breeds, although the majority of dogs do not single track but leave 4 footprints in the sand. 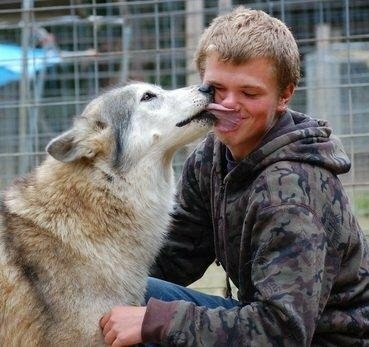 One of the greatest rewards when working with the wolfdogs is when they accept us in trust and love. I had a wonderful breakthrough with Thala a few weeks ago. I had been trying and trying to get her to let me touch her and she finally did! It was just so awesome. She started out letting me touch her muzzle and then after a few minutes, she let me progress to her ears and head. I just kept telling her she was safe and loved and then she let me hug her! I mean, really hug her! I was elated because I had been trying for five months to get her to trust me enough to allow me to touch her. There is no other feeling like that very moment when our spirit mingles with that of these beautiful creatures. It's as if the air tingles around you and there is a spiritual connection that is such a pinnacle in life! I felt so honored! I don't know if this qualifies as a miracle, but it was to me! A big Group Howl of thanks to J. Scott Hill, CPA and his wife Lynn, of Wilson, NC for preparing our Fiscal 2010-2011 - 990 tax returns. Thank you to our volunteer Cory Sistare who went to evaluate Isabella and bring her to her new home at Full Moon Farm. Thanks to Justina Prenatt and the kind folks at MyNewsletterBuilder for helping us make the transition from one editor to another. Thanks to Gary and Kathy Borland from Tampa, FL for the use of their pictures, and donation of prints for our gift shop. They will make a monetary donation to anyone who rents their Hideaway Cabin, http://www.deepcreekhideaway.com/ and mentions Full Moon Farm. Thanks to Georgina Hricak and Digital Pathways Consulting, LLC. for providing our website hosting and assistance.